It's time I posted about the Beatles renaissance I'm experiencing, and how it happened. In 1977, when I was almost 17, my parents opened a record store in Brunswick, Georgia, Rock-n-Easy. By that time I had already been a big Beatles fan for years. On our very first day in business a fellow came in looking for anything Beatles-related, and we instantly bonded over our mutual love of the band. This was Bill Gronroos, five years my senior. I quickly learned that Bill knew ten times as much as I did about the Beatles, and his collection was probably ten times bigger than mine. While I was satisfied just to have a copy of every American album (at that time I was unaware of the British albums), Bill was a bona fide collector, and a very knowledgable one. He owned everything I had, plus the British albums, virtually if not all of the singles and EPs, and books, collectibles and so on. For the next 41 years Bill was my best friend, absolutely the very closest friend I've ever had in my life. I always called him my brother. More than a Beatles fanatic, Bill lived and breathed the music of the 1940s through the 1970s, particularly rock but also swing, big band, soul, r & b, country and pop. He spent his life collecting and studying the history of the music he loved, and was a walking encyclopedia of popular music. On countless occasions I asked Bill who a certain song was by. He always knew, and would usually go on to tell me who wrote and produced it, who played on it, what studio it was recorded in, etc. But while he loved all of the music I've mentioned, there was no one he loved nearly as much as the Beatles. On January 20th of this year a heart attack took Bill away. He was only 62. Bill never married, but had many relatives here in Brunswick, and throughout our long friendship his wonderful family always treated me like a member, inviting me to family dinners, gatherings and birthdays. And after Bill's death they most generously offered to let me have anything and everything of Bill's that I wanted. I put off going through his collection as long as possible, because it was going to be painful, and because I wanted every member of the family to make certain they had taken anything they wanted first. At last, though, they phoned to say that I had one more day, and that on the next day everything not claimed would be sold. Going through everything was physically difficult because the power had been turned off after Bill died, so it was dark and the heat was sweltering. And while my brother had countless virtues, neatness and organization were not among them; everything was everywhere, "helter skelter." Still, I came away with an embarrassment of riches. And as if that wasn't enough, the store that bought the rest of Bill's collection, Kreepo Records and Comics, made me an outstanding deal on some of the Beatles items I hadn't located. My modest collection grew exponentially overnight. And Bill handled his records and CDs with extraordinary care; there isn't a fingerprint, a scratch or a hair on anything. All of the 2009 remastered stereo CDs (and on my birthday a few years ago Bill gave me the 2009 mono box set!). Near mint copies of the Anthology CD set, DVD set and hardbound book. Both "Live At The BBC " double CDs, both editions of "1" (the CD only edition and the one with the CD and DVD), the Let it Be... Naked CD (including the "Fly on the Wall" disc), the red and blue CDs, and Love. The lavish 2017 Sgt. Pepper box set AND the 2017 remix on vinyl. The big HELP! CD / DVD box set (made in Denmark, I think). The two disc DVD set of A Hard Days Night. The five CD box set The Beatles: Artifacts from Italy, 1993. 40 Beatles bootlegs on CD and I don't know how many on vinyl. Most of the core albums on vinyl, including variations. Thank you, Bill, wherever, whatever you are, and thank you, Mauri, Edna, Rocky and Warren... I'm in Beatles heaven! But I'd trade it away in a second to have my brother back. I have 7.004 billion brothers and sisters. Bill is glad you have those items. I certainly will always treasure them. I haven't been here in about two weeks and I guess I owe an explanation. I got a job. Like a real day job. Last month. I also started some freelance work before. So I'm basically working two jobs. I don't really have much time for the Beatles Bible these days. Maybe when the freelance assignment ends. Yay for a job, @Necko! Stop by and see us whenever you get a chance. I got new monitors for my computer at work. Ahhhhhhhh, I can see. I can see. I can see all of my Sierra screen. Not more tabbing or scrolling to see the whole screen. It's there all together...in one big picture!! You beautiful people* are coming in in High Definition now. Apologies to all for my relative inactivity and tardiness on the forum in recent weeks (and for not replying to emails as I should have, @Ahhh Girl, @Into the Sky with Diamonds). I haven't been feeling too good, been battling my own "black eyed dog". The doctor upped my medication last Thursday, and I'm starting to stumble out of the "black mist round my soul". Hopefully, within the next few days, I will get fully back on track. Glad you're on the upswing, @Ron Nasty. I'm hoping for replies to the emails I've sent you. Do you feel like giving us a song description for the game? In my life - my mom's sister isn't doing well. She may pass away this week. The thought of her leaving us is giving me a headache. To you RN. You'll be on track soon, I hope. I'm sure your mum's sister can pull through AG. They put her into palliative care a few hours ago. It really is just a matter of days now, if not hours. Sorry to hear about your Ahhhnt, @Ahhh Girl. Sorry to hear about your aunt, @Ahhh Girl. Hope you are feeling number one, number one again soon, @Ron Nasty! Fingers crossed your aunt pulls through, @Ahhh Girl! Are the leaves turning fall colors where you are, @Beatlebug? Oh, no -- it's not been cool at all till now. Leaves don't really turn in lower-elevation NC until November. They're probably beginning to get pretty up in the mountains, though. 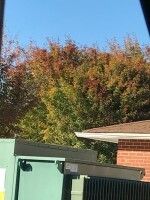 In Washington the leaves are at an unbelievable color.